Poet's Notes: Blackberry pie, blackberry cobbler, blackberry jam, blackberries on my cereal. 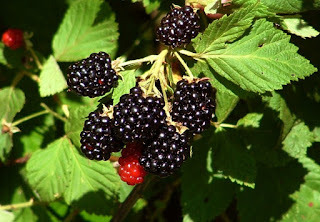 In the summer, my mother and I would pick quart after quart from bushes where houses now stand. She and I still pick blackberries wherever we can find them, protected by long sleeves and long pants, but with bare hands reaching. I wrote this poem to celebrate the reward despite the effort. Editor's Note: I love the way this poem forms a nice, juicy image. Reminds me of the delight I find in discovering boysenberries growing wild in a park or on the road. "blackberries" first appeared in the 2010 spring/summer issue of The Aurorean. A brief biography of the poet may be found here: http://www.eretzsongs.blogspot.com/2015/07/poet-of-week-lauren-mcbride.html.